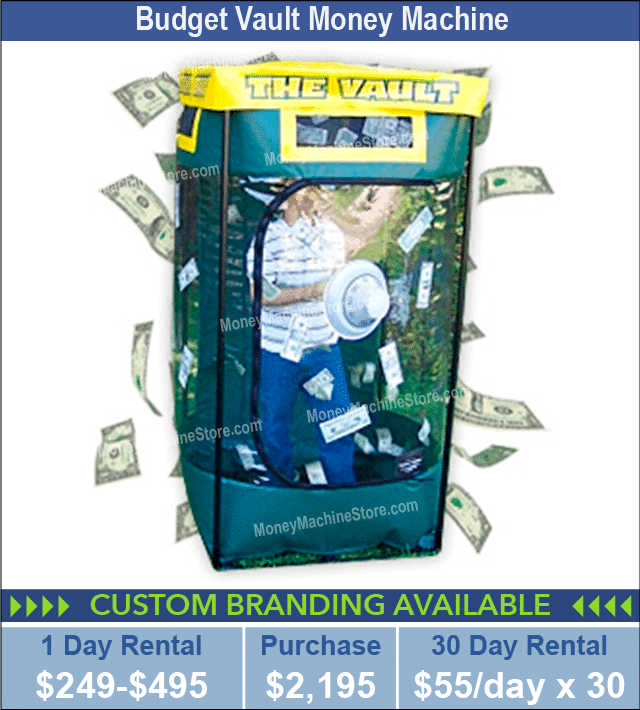 For 30 years The Money Machine Store has been the go-to promotional entertainment supplier for Florida businesses looking to make their trade show, casino party, company party or promotional event unforgettable. 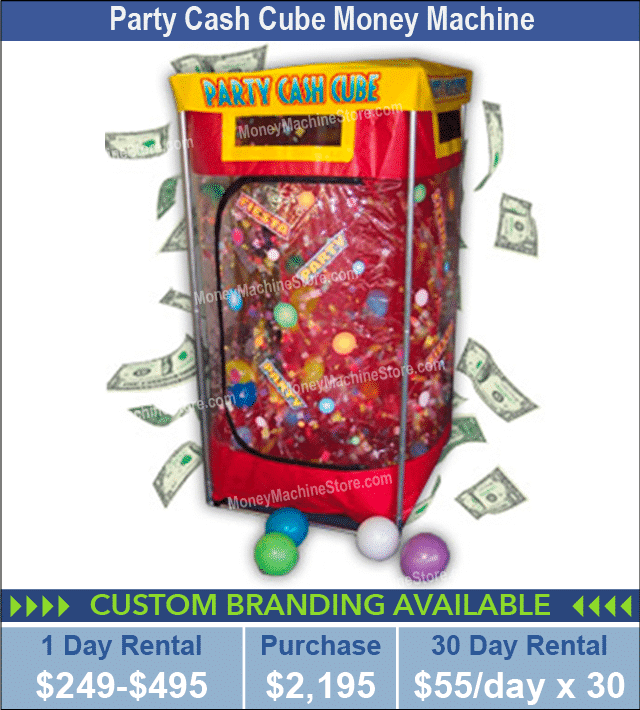 Our Cash Cube Money Machines are the top pick for events at the Orlando County Convention Center, Miami Airport Convention Center, Tampa Convention Center, Palm Beach County Convention Center, Ocean Center, Prime F. Osborn III Convention Center and The Jacksonville Fairgrounds. We have the Sunshine State covered from top to bottom, coast to coast! 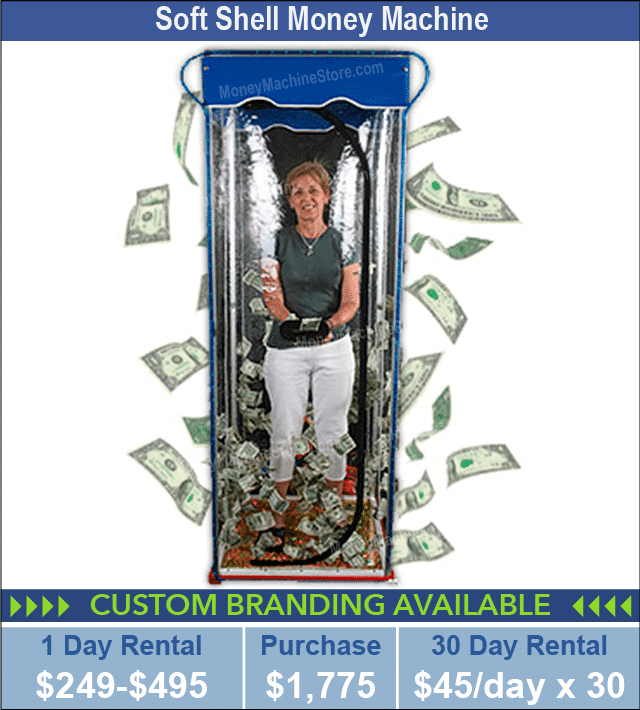 Planning a promotional event at your Florida car dealership and giving away a car? 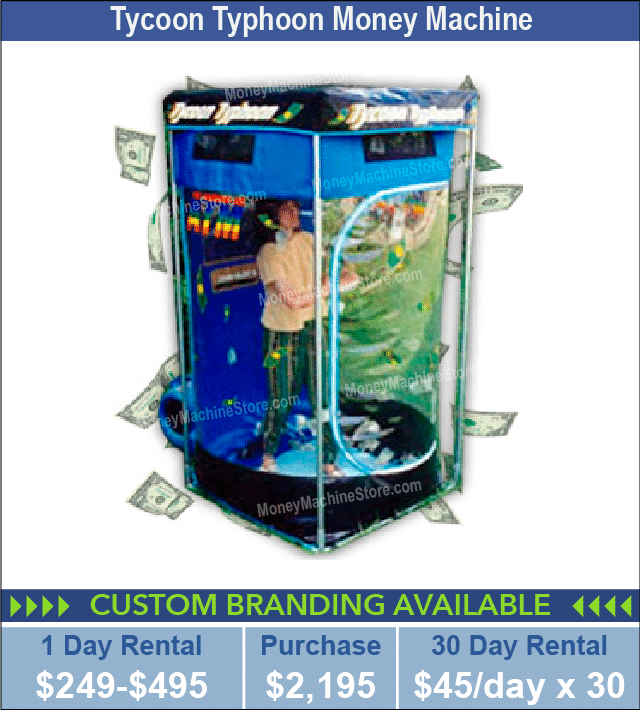 Give guests the chance to grab it right out of thin air in the form of a voucher blowing around the money machine! 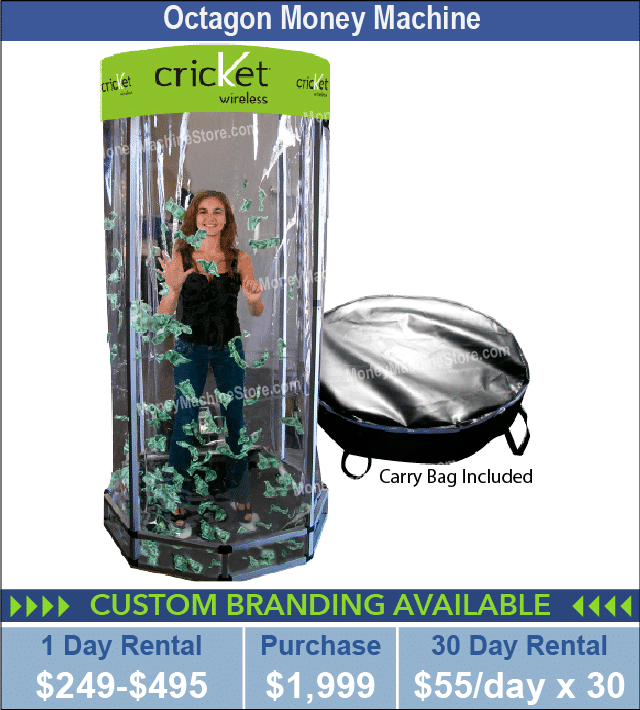 Want to give your employees some excitement at your next company picnic or holiday party? Let them try their luck in the money machine – grabbing for money, promotional vouchers, prizes and more! 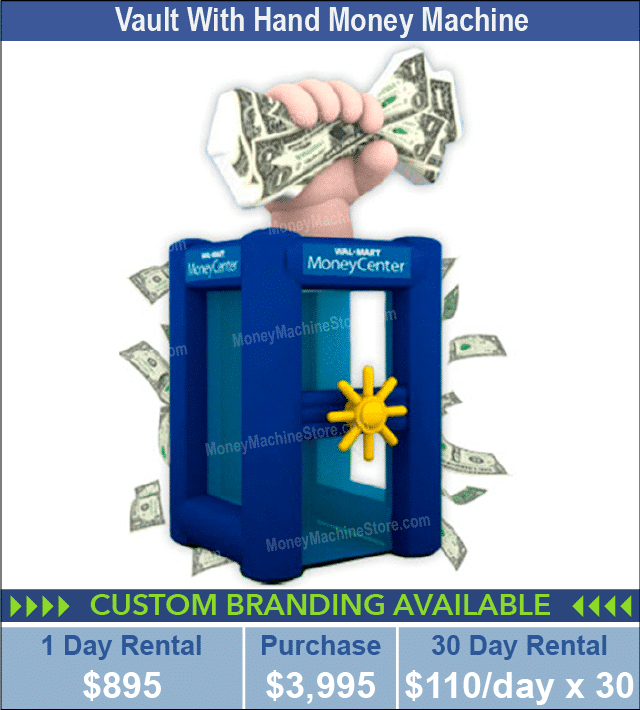 The Money Machine Store can even design custom promotional certificates and money with your company logo for your next Florida event! 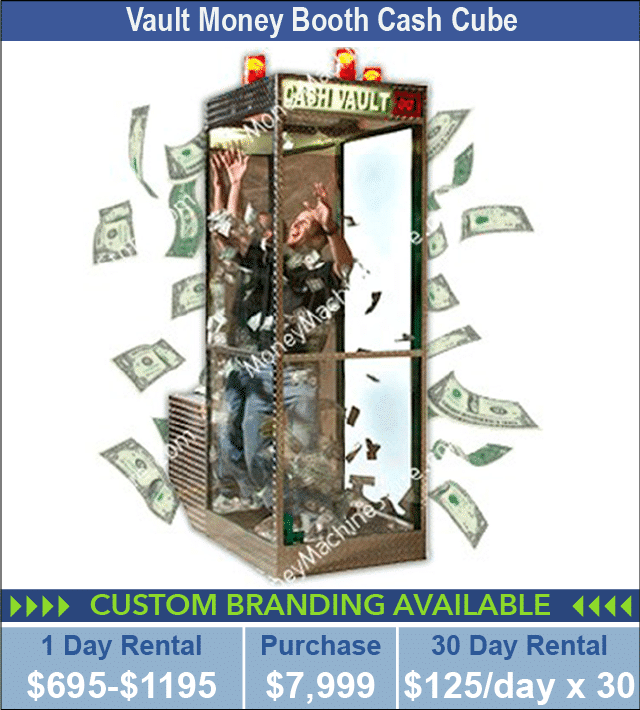 Contact us today 800-573-3111 to learn more about our Cash Cube Money Blowing Machine rentals. 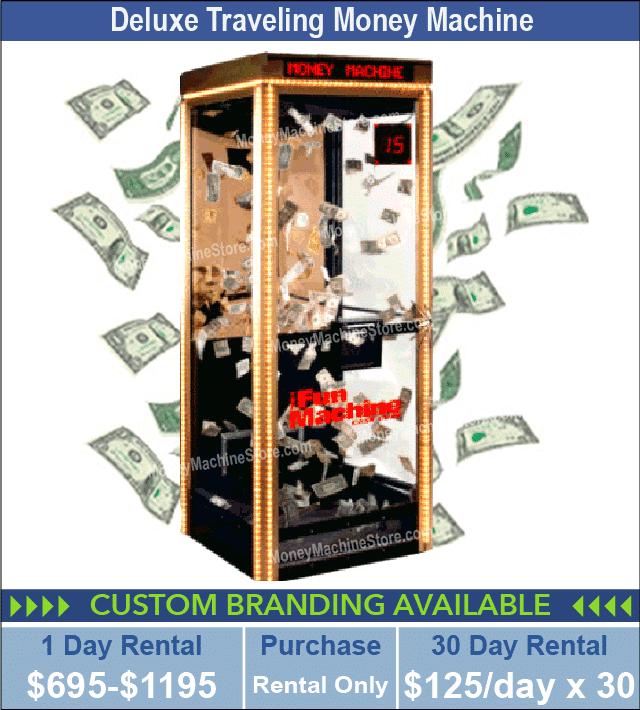 Our representatives are ready to help you choose from our 20 models to rent or purchase for sale, as well as delivery, installation and removal. Serving – Orlando, Winter Garden, Kissimmee, St Cloud, Palm Bay areas.  Serving – Miami, Fort Lauderdale, Pompano Beach, Davie, West Palm Beach areas. Serving – Jacksonville, Gainesville, Daytona Beach, Tallahassee, Pensacola areas. Serving – West Coast, Tampa, Clearwater, St. Petersburg, Lakeland, Cape Coral areas. 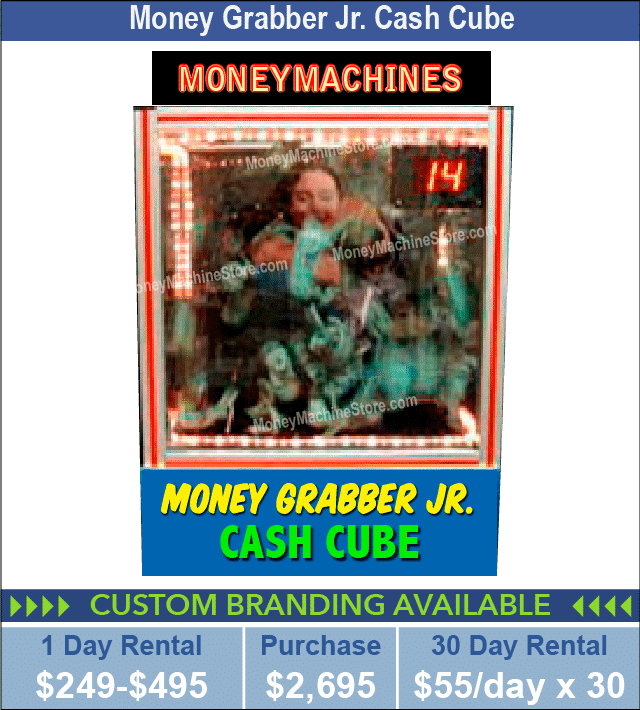 You’ve found the Sunshine State’s number one provider of the Cash Cube Money Blowing Machine! 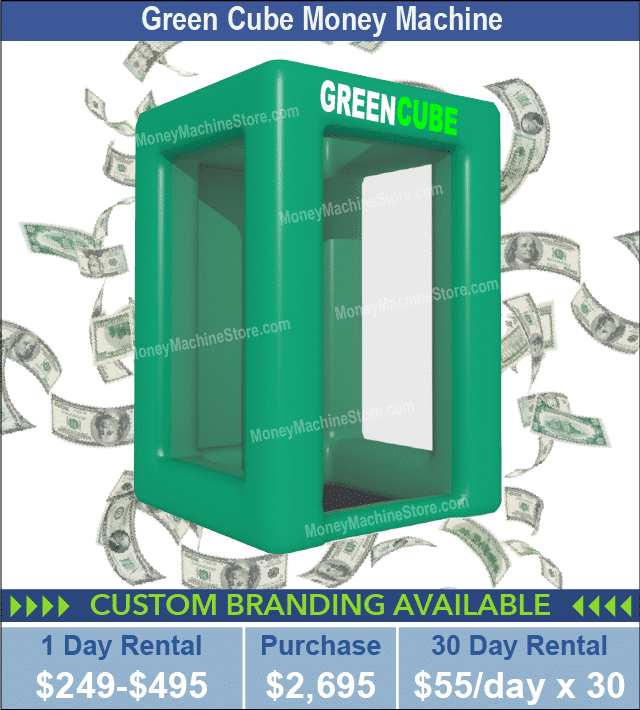 Cash Cube Money Blowing Machines are used by companies all over Florida to draw a crowd at tradeshows, casino parties, fundraisers and company events. 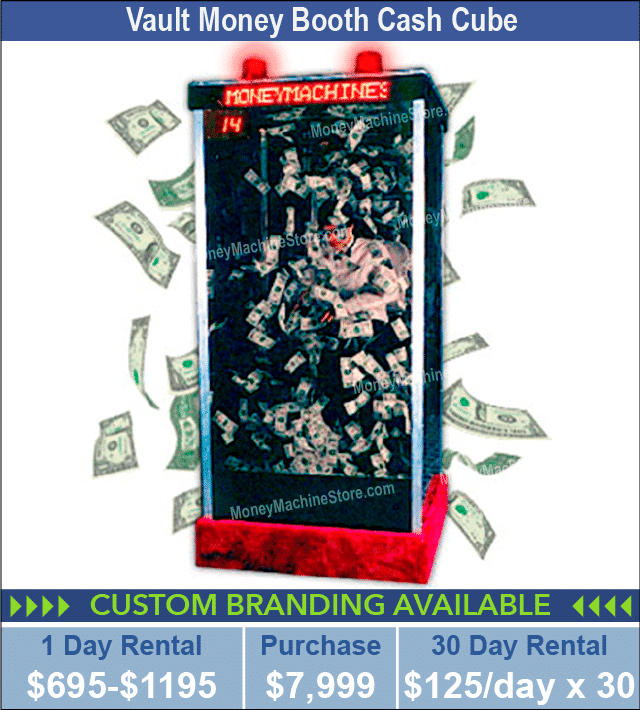 Whether your event is being held in Orlando, West Palm Beach, Miami, Daytona Beach, Tallahassee, or any other large or small city throughout Florida, The Money Machine Store will get a Cash Cube Money Blowing Machine to you. 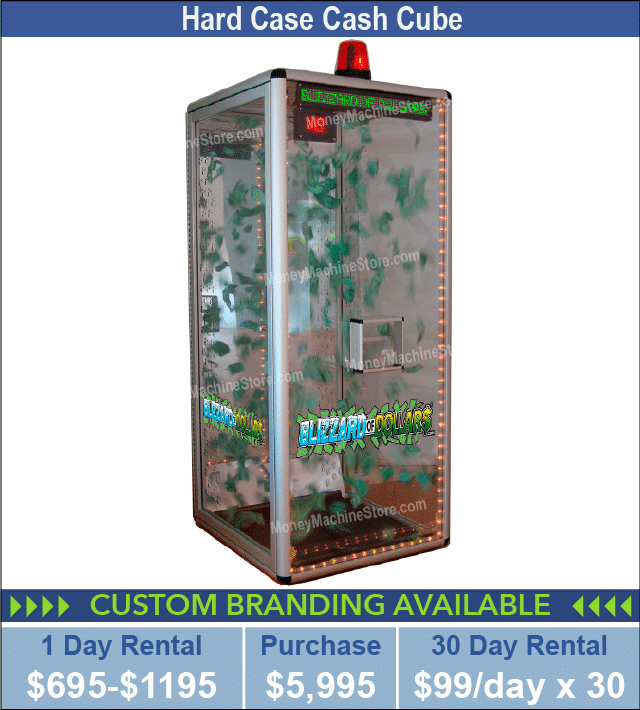 Let us be your supplier for all of your event needs from the Atlantic Ocean to the Gulf of Mexico, from the Florida Keys to the Florida-Georgia Line. 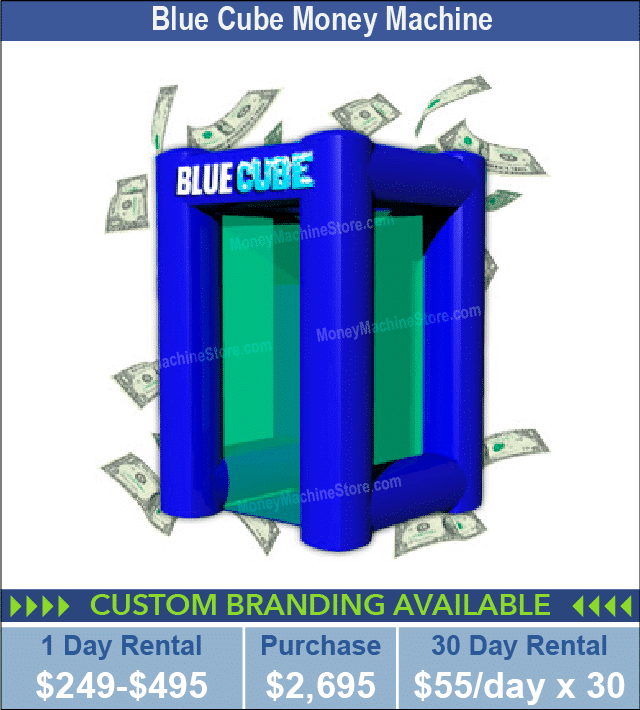 Our Cash Cube Money Blowing Machines aren’t just for corporate events and casino parties. 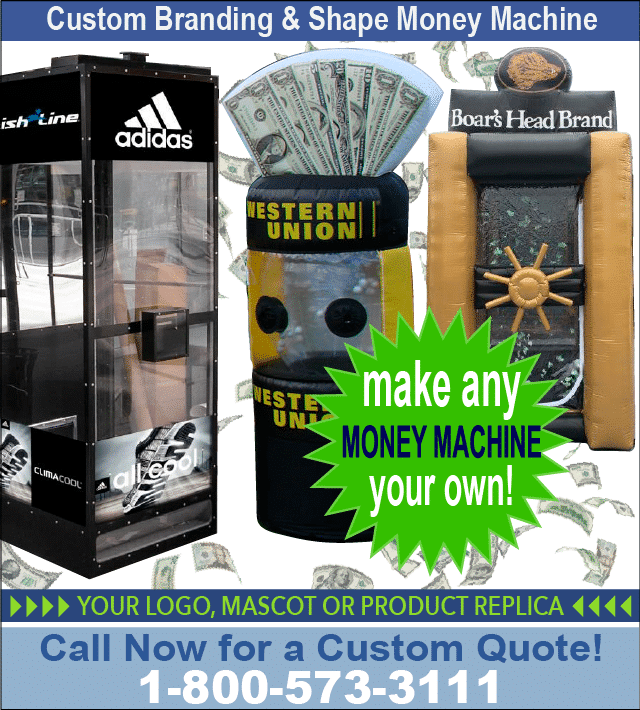 We have supplied our machines at Florida high school and college fundraising events, the Florida State Fair, class reunions, and birthday parties. 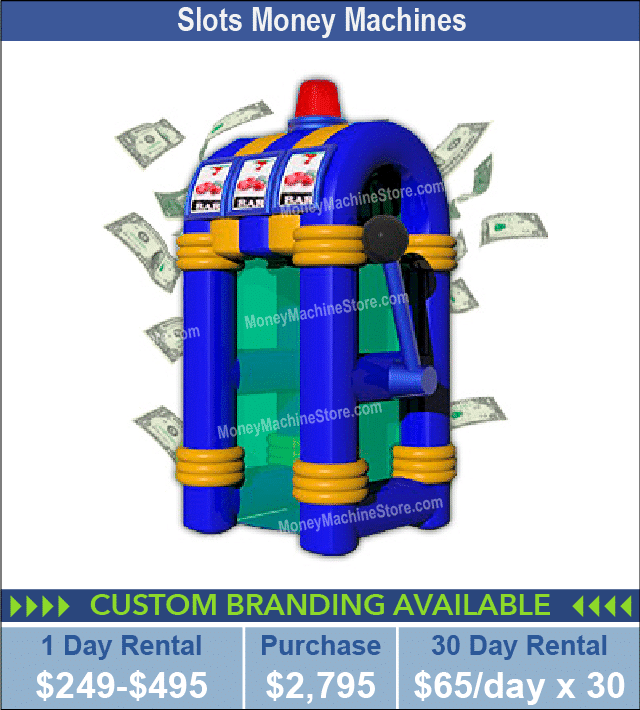 No matter how large or small, formal or fun your event is, look no further than The Money Machine Store for your Cash Cube Money Blowing Machine. 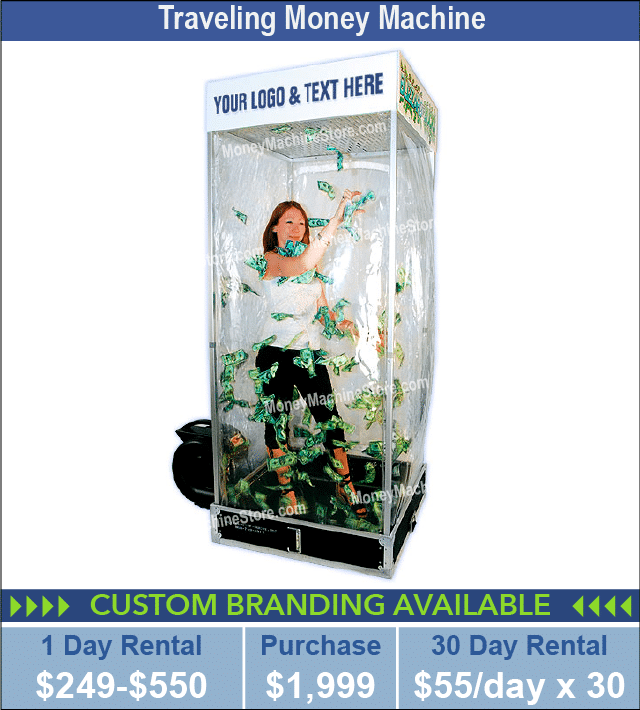 Several companies throughout Florida have purchased our machines for marketing events throughout the year at venues such as Edgewood Beach & Golf Resort in Panama City Beach and Broward County Convention Center in Fort Lauderdale. 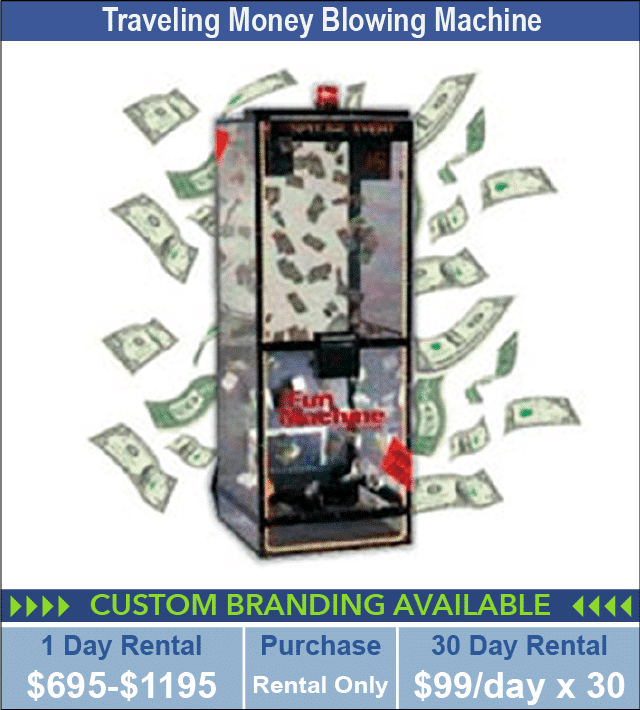 Our representatives can help you decide if you would be best renting or purchasing a machine. 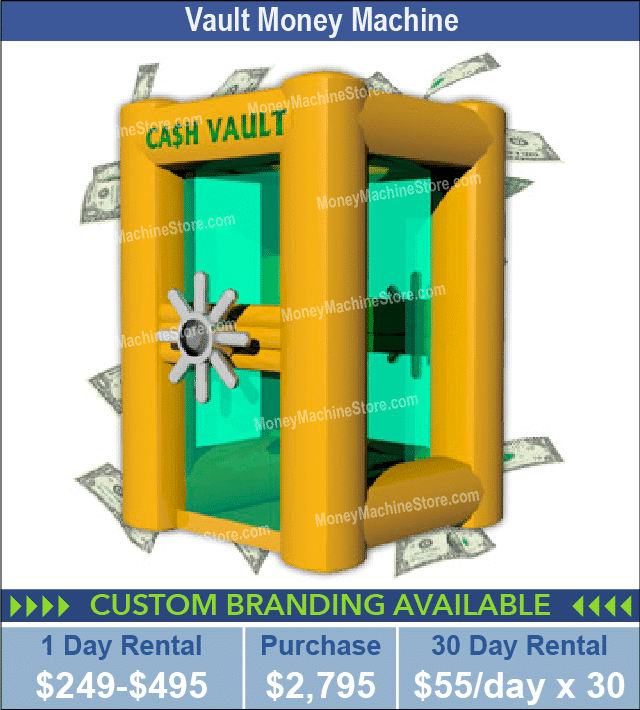 Rent or purchase one of our Cash Cube Money Blowing Machines for your next Florida grand opening, bank or credit union event, product launches, and broadcast promotions. 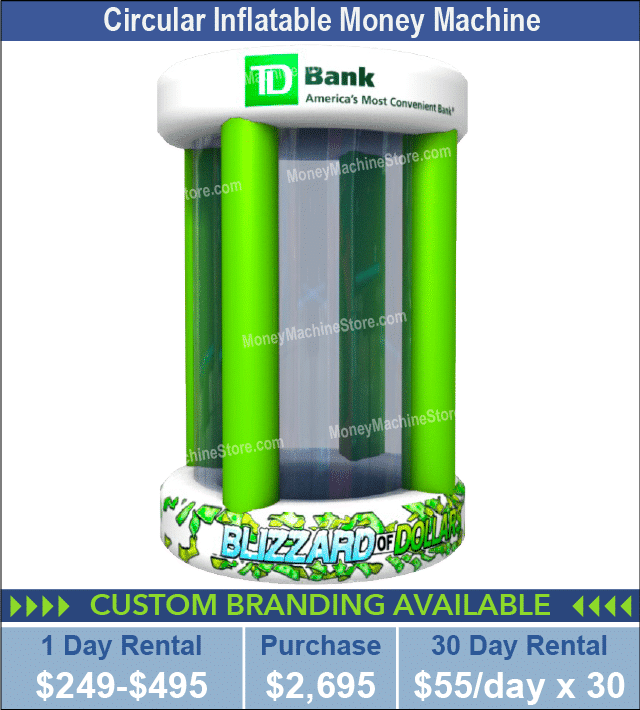 You are guaranteed to pique the curiosity of the crowd and draw prospective customers for a chance to grab at what you have chosen to fill the Cash Cube Money Blowing Machine with! 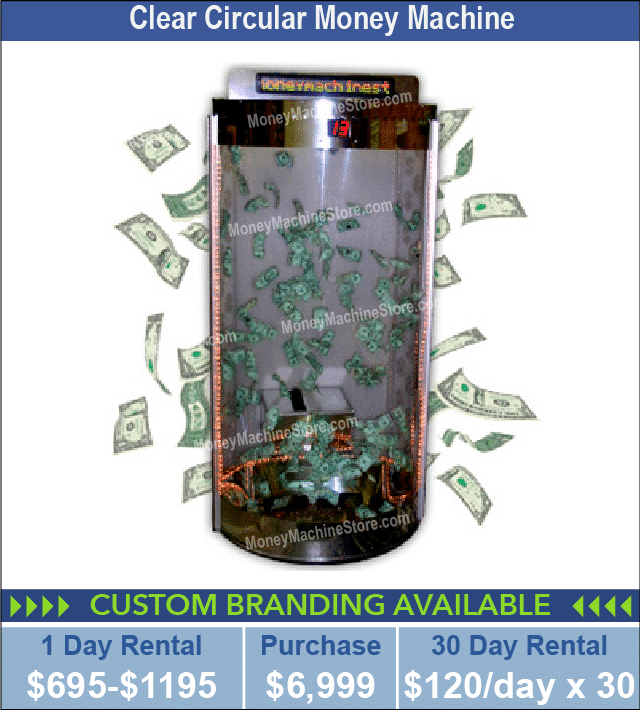 If you want to drive customers to your booth at the International Plastics Showcase in Orlando, or encourage RV sales with promotional dollars at the Florida RV Super Show in Tampa, give The Money Machine Store a call today at 800-573-3111. We are your source for event attractions in Florida. 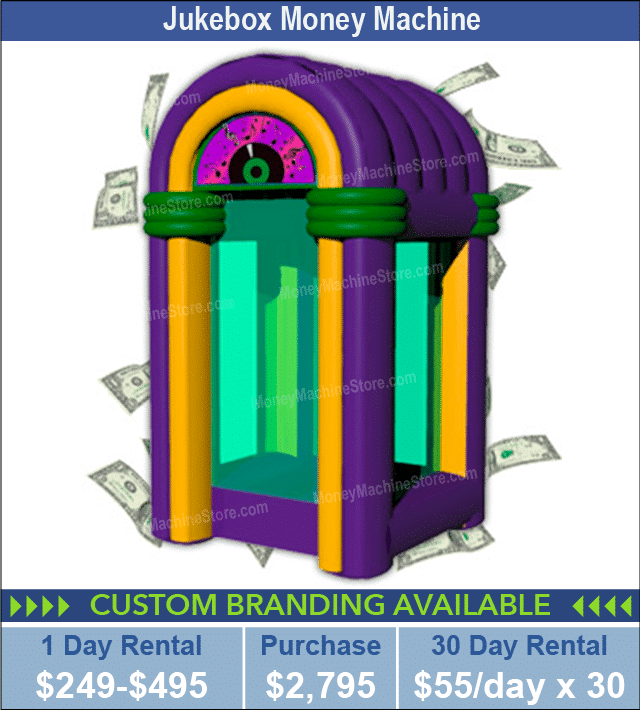 Ask our representatives about our other event marketing products, like our Prize Safes, Prize Wheels and custom imprinted products from our sister site www.PromotionStore.com We are ready to go over your upcoming event details and pair you with the perfect attraction for your budget.